Qualcomm snapdragon 712 Vs HiSilicon Kirin 710: Which one is better SoC? According report, Huawei has released their own HiSilicon Kirin 710 chipset at the moment when Qualcomm was launched Snapdragon 710 Chipset for their phones. We are seeing that naming conversion was same which creates confusion for users to select better chipset. As we have discussed in previous article which describe, SD712 has powerful camera, display, connectivity support, Storage, CPU & GPU options than Snapdragon 660 chipset. 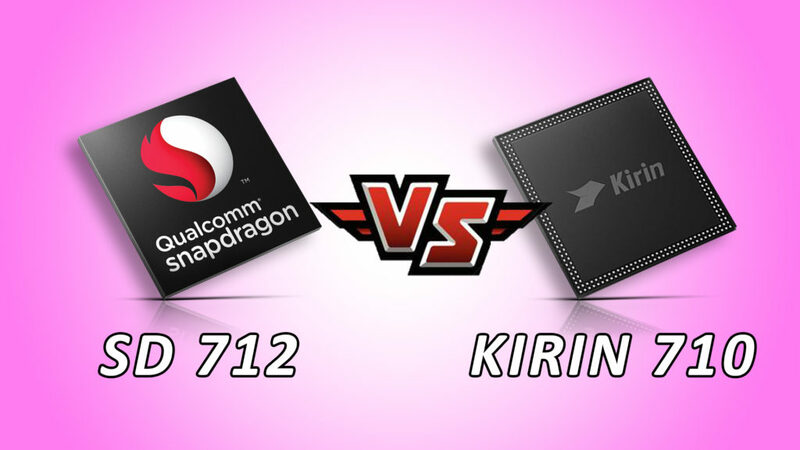 Here, we are going to compare Qualcomm snapdragon 712 Vs HiSilicon Kirin 710 chipset. Which one is better SoC? For those who are not aware, Qualcomm is responsible for making powerful chipset in different segments that is SD400 series for budgeted phone, 600 series for mid-range Smartphone and 800 series for premium phones. Now, the company has released 700 series which provides more power to upper mid-range segments. Snapdragon 712 is successor of SD710 SoC. Qualcomm Snapdragon 712: This chipset is based on 10nm FitFet process, 64-bit octa-core processor. It has 8 Kryo 360 cores which mean 2 Gold Cortex A-75 cores and 6 Silver Cortex A-55 cores. When we talk about both cores, Gold cores are used for Intensive tasks while Silver cores are handles day-to-day normal tasks. Its clock speed is 2.3GGHz. HiSilicon Kirin 710: It is an octa-core chipset based on 12nm FitFet process. It has two core in which 4 Cortex A-73 cores clocked at 2.2GHz and 4 Cortex A-53 cores clocked at 1.7GHz of minimum speed. We are seeing that SD72 has more powerful CPU with higher clock speed on comparison to Kirin 710. So, Snapdragon 712 is winner in this case. When we talk about AI performance of Snapdragon 712 chipset, there is need of AI improvements on it. This chipset has Hexagon 685 DSP to handle all Artificial Intelligence tasks, while AI capacities of Kirin 710 get is its AI Scene Recognition. It can adjust the scene while taking photo using AI. RAM: SD712 supports LPDDR4X RAM up to 8GB and UFS2.1 & EMMC5.1 based storage, while Kirin 710 can support LPDDR3 RAM up to 10GB and LPDDR4 up to 6GB. It can only support EMMC5.1 based storage. Camera: SD712 has Qualcomm Spectra 250 Image Signal processor which support for 32MP single camera and up to 20MP dual camera sensor, while Kirin 710 supports 40MP + 24MP dual camera. At the moment, there is no information available about single camera support for Kirin 710. Display: Snapdragon 712 support Quad HD+ with 3360 X 1440 of screen resolution display, while Kirin 710 can only support FHD+ with resolution of 2340 X 1080. SD712 has X15 LTE MODEM which support LTE cat 15 to give peak download speed up to 800Mbps and Cat 13 for upload with speed of 150Mbps. Other connectivity features includes Dual 4G VoLTE, dual brand Wi-Fi, Bluetooth 5.0, NFC, GPS and USB 3.1. On other hand, Kirin 710 has LTE MODEDM with LTE cat 12 for download with speed up to 600Mbps and Cat 13 for Upload with speed of 150Mbps. It can only support 2.4GHz Wi-Fi and Bluetooth 4.2 & GPS support. I hope this article helped you to decide which one is better SoC. 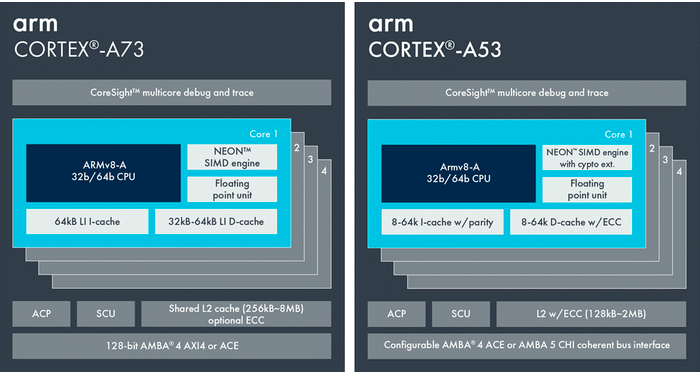 Snapdragon 712 is more powerful SoC which has new and strong Cortex A-75 & A-55 cores. It has better GPU, camera and display supports, than Kirin 710 chipset. What do you think? Which one is best SoC? You can share your thought on the comment box given below.